I can’t stay away from Dean’s Fork in late summer. Every time I walk, trot, lope or jog it, I see a new constellation of creatures, birds, plants. I never know what’s waiting for me. Early morning is magic, the wood thrushes are in full song even in late July, and the fact that all the other birds are mostly quiet only highlights their ethereal flutes. At any one point on the road I can hear four or more at once. 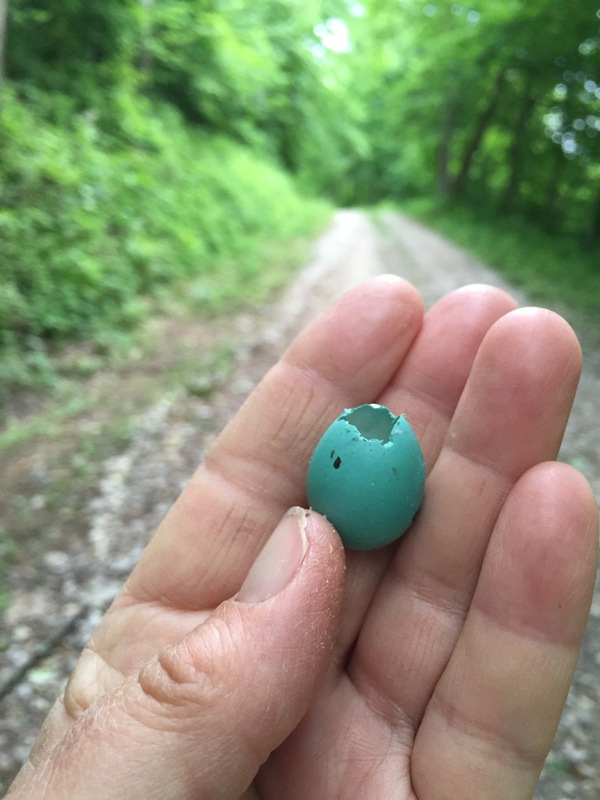 I’ve found several eggshells on the road, freshly pipped; clearly, this wild woods cranks out wood thrushes, and that makes my heart sing. This one wasn't pipped by a wood thrush chick; it was predated, probably by a jay. It was June 10. I had just spotted a female wood thrush hauling a huge wad of nesting material across the road, and thought, "Huh. Looks like she's tearing her old nest apart and rebuilding it elsewhere. Wonder if it got predated..." when I looked down and found this empty egg. That's situational awareness in action, and a small turquoise reward for paying attention. Just before Phoebe left for California in June, we walked Dean’s on a sparkling cool day. I wrote about it in her birthday post. One photo I left out of that post, out of consideration for my girleen, was what we found on the road when we scared up a family of crows who were foraging as we walked around a bend. I fought with myself for awhile about this photo, knowing the sensibilities of many who read this blog, but I find it so beautiful and powerful I knew I had to share it. Crows gotta eat, same as people, and what’s on their menu is baby birds. This wood thrush nestling, looking with an unseeing eye on a woods it will never get to know, moved me, but not in a take-down-the-shotgun-and-shoot-crows way. I love crows. I will always love crows, just as I love wood thrushes. 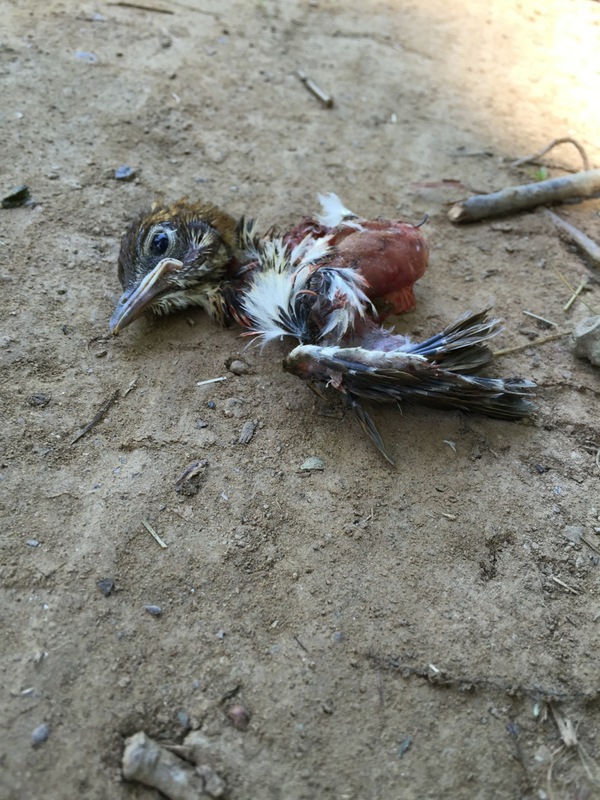 Having raised a wood thrush, having been its surrogate mother, this photo is hard to look at. But it is. So much of moving easily through nature is accepting what is. Where nature is concerned, I have an unblinking eye. I want to know what goes on out there. I want to know who pierced the egg, who halved the nestling, who left the toad eggs, the rabbit omentum strewn across the meadow. My first reaction is rarely “Eeew!” but rather “I’ve never seen that before.” Or, “Would you look at that!” I take it all in, and while I harbor an abundance of emotion, and it makes its way into my writing, I find that very little that I observe in nature really disturbs or upsets me. It’s the workings of man that do that. Those are all around. Those, I prefer not to write about. We are blessed with wood thrushes here. This area-sensitive bird has vanished from so many smaller woodlots, forest fragmentation and the resultant incursion of brown-headed cowbirds taking a terrible toll. This is why I haunt big woods, why I am drawn down Dean's Fork again and again. There is an intactness about the place, a feeling that everything--from damselfly to box turtle to bobcat--is still here, in its place, safe, more or less, and undisturbed. It is my Eden. 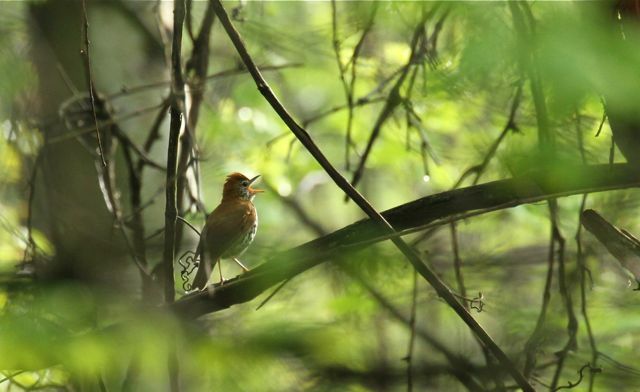 To judge from their songs, wood thrushes must continue to nest well into summer, or why would they be holding territory with their music? Listening, one might conclude it’s for the pleasure of singing, but bird behavior is generally more directed than that. I made this little video in late evening on my birthday, in late July. At the end, I say, "It's my birthday, and I've got my Dean's on." Listen and swoon. Try to ignore the endlessly pippering baby cardinal, and dig those countersinging wood thrushes! I think of this video clip as a rainbow after the thunderstorm. The thrushes sing, telling us that life goes on through all the predation events, the rebuilding, the sadness. These thrushes don't know that theirs is a declining species, vanishing everywhere due to habitat fragmentation. They only know that they must sing on July evenings, and light up some bird lovers' hearts. I was watching a crow just this morning, maneuvering its way to eat the inside of the fruit of our Autograph tree (Clusia rosea). The fruit opens at the bottom to expose red berries and s/he was hanging upside down to grab those berries. Julie, I'm with you on the unblinking eye. We live in an incredibly beautiful and wild place and try our best to let nature do what nature does. Thank you for stroll and the lovely wood thrush vespers and of course, the bacon. Tough to have an unblinking eye...but it's better than rose colored glasses. (1) Wood thrushes are vanishing from my not-quite-suburban space in Upstate NY (I used to hear them here, but we haven't had a single one for two years now). So I'm glad you've got them. And I was glad to hear them when DH and I arrived in deep suburban CT two months ago for my brother-in-law's wake: That flute music made a hard time a bit easier to bear. (2) As you know and have tried for years to explain, nature is tough on young birds. I follow the Cornell RTH webcam, and some folks announced their intention of bailing out there after two of the three fledglings there came a-cropper (one died, one is in rehab and expected to recover). It is what it is, folks. Anyway, all the best to Phoebe on her new adventures, and to all the other denizens of Indigo Hill as well. Does anyone successfully feed them so that they come back to your By.? I had one here in late June singing. Only heard once. I would be happy to foster a wood thrush family in this habitat, just in case it suits. Meanwhile, I'm probably still a few months away from the time I can observe a jay without curling my lip a little. And jays and I used to be just like THAT. I would toss them bug larvae as I found them while gardening. We were a team. I never tossed them nuthatch babies, so I don't know where they thought they got permission for that. I thought we had an understanding. It took me a while, but I think I've finally come to terms with bird on bird predation in my backyard. I guess falling in love with the Hanover, PA eagles on the EagleCam started me thinking about predators, and the important part they play in Nature. But they aren't in my backyard, so it was strictly academic. Then, a week or so ago, a Cooper's Hawk couple moved into my yard. (I assume they are a couple. One is a good bit bigger than the other, and they hang out together most of the time. I know that with Eagles, the female is larger. I'm assuming that it is the same case here.) The first time I saw them, they were splashing around in our pond, and I was immediately smitten. We have a LOT of birds, mostly sparrows, cardinals, and wrens. In fact, we were commenting on how bird-intensive our yard has become this year. Well, too many of anything is generally detrimental, and I figure that the Coopers take out mostly the weak, sick, old, or feckless. It keeps the species as a whole in fine fettle. Makes me think that humans could probably use a SuperCooper to thin the herd a bit. I think we don't get to love nature without loving all of it and staying out the way of of its food webs. I appreciate this blog that shows how nature works. All of us have to kill some plants or animals to live our own lives. But that should not take away respect for all living things. Very thoughtful, reflective post...yes we experience sadness and joy in nature! That's what life is, isn't it? And in that space, we find gratitude!